My name is Mark. 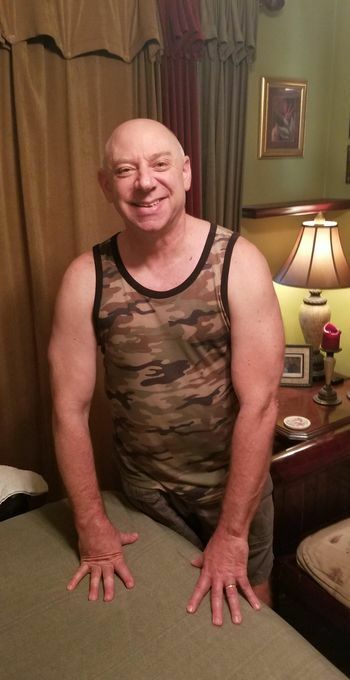 Let me offer you my 11 years of doing gay massage by having you relax and unwind on my professional table, listening to soft relaxing music, giving you the massage you deserve and want. I welcome all men on my table. Gay, straight and bi-sexual, and I do not discriminate against age, weight or body-type. My goal, using my swedish-style technique, is to give you stress relief and total relaxation. Over the years, I...More have developed a very organized and balanced routine. I guarantee you will be left with a feeling of euphoria and well-being. I always use fresh laundered sheets and towels and a Biotone massage crème that will absorb into your skin and won't leave you feeling greasy. Thank you for your time and I look forward to hearing from you so we can let the healing begin. Great massage! Mark paid attention to my reaction to his touch, checked in with me, and gave me exactly what I wanted. He focused on my shoulders and lower back, which is where I carry a lot of tension, and his technique felt wonderful. He used long, flat-handed strokes, which are exactly what I like the most. I left feeling totally relaxed. This was my first visit with Mark, but it most certainly will not be my last. I would describe Mark as professional, skilled and eager to ensure that the massage meets your needs and preferences. I have had massages everywhere from Hawaii to Barcelona to Sydney and I would rank his service among the best ever. I look forward to becoming a regular client. Truly top notch.